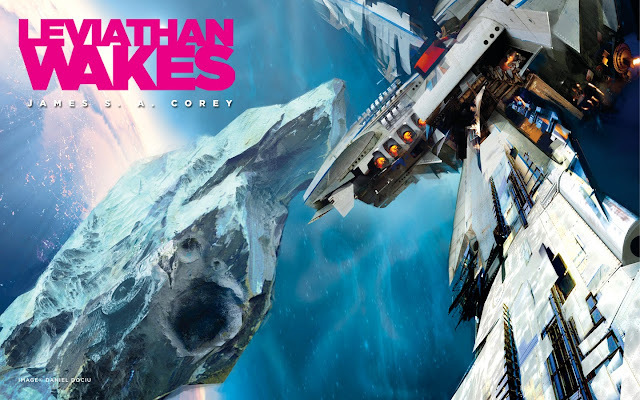 Leviathan Wakes (or Leviathan Awakes, as the narrator calls it for some reason) is a solid work of sci-fi, providing interesting flawed characters thrust into an insane situation that just spirals further and further out of control (with their help) in a setting ripe for exploration. Everyone has their own agenda, and everyone thinks they’re doing the right/best thing. Unlike most “space opera” the events of this book are almost entirely within and between the orbits of Mars and the asteroid belt, both of which have been colonized. However not all is happy within the human family. The Belt, Mars, and Earth are all antagonistic toward one another. 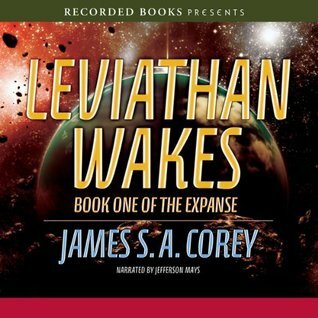 Toss in some amoral interplanetary megacorps, and you’ve got a powder keg ready to blow, and like any good author, James S.A. Corey knows when to light a match. The main protagonists are Miller and Holden. One is an old drunk detective obsessing about a case, the other is an ideological XO of an ice hauler out in the belt. Together, they might just save the human race. Plus they kind of hate each other. Saturn got in the way, and we were left to develop on our own. Then a scientific team found it, with predictable results. All in all I really enjoyed this book. There was a lot to enjoy, and the setting is delightfully rich, and while it's a little on the long side, it never drags. It isn’t “hard” sci-fi, but it’s pretty firm, and the comparison to Firefly and Cowboy Bebop isn't too far off. I’m definitely going to have to see what the next book in the series has to offer. My biggest complaint with the book had little to do with the book itself, but with the narrator. I’d definitely recommend skipping the audiobook, and reading a dead tree or e-book version. With a flash of lightning and a crack of thunder, the mummified remains of the witch queen crumbled. The smell of ozone and old dust wafted through the air as Rathgar pulled himself out of the collapsed bookshelf. 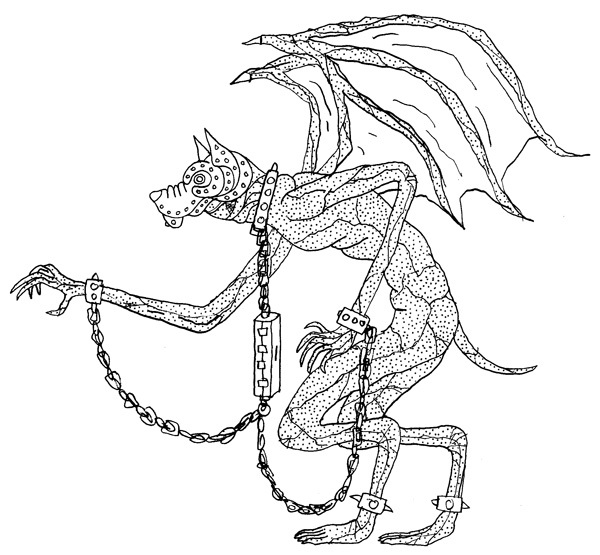 "THE FRELLING HELL" he yelled, trying to be heard over the ringing in his ears. Nimble shook his head a couple of times, then snapped his fingers next to his ears. "A lightning bolt?" he said, not quite yelling. "Sorry, I didn't actually know what the wand would do." Feris said sheepishly as he tucked the teak wand into his belt. "But I figured... Was that glowing before?" He pointed to a fleshy cube hanging from the ceiling that gave off a pinkish glow. "No, it wasn't" Allianora said with a frown. Nimble grabbed his pole, and unhooked the chain holding it to the ceiling. He lowered the box down, and set it on a table in the corner. Through the gaps in the stretched flesh, A dry looking larval thing squirmed on the bottom of the box. It reared up and the witches face looked back at the companions, and hissed. This cage was created by Shen'Dall to contain souls that she used to trade with demonic merchants. Destroying the mortal form of a creature with a soul by magic allows the cage to grab the soul and contain it at the moment of death. The cage can only contain a single soul at a time, and the soul can only survive for 48 hours thus caged before it will die permanently. 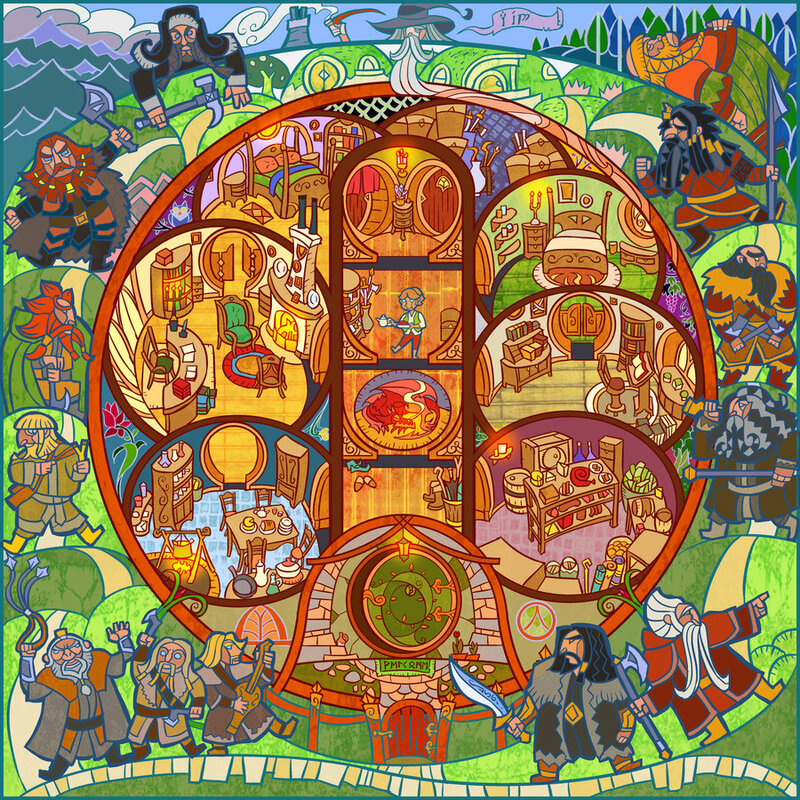 Race (Elf, Dwarf, Halfling) as a class? Generally yes, though I’m also a fan of race specific classes like ACK does it. Do demi-humans have souls? I’m inclined to say no, at least not like humans do. That doesn’t mean that can’t be brought back to life, just that the ways humans do it won’t work on demihumans. Ascending or descending armor class? I prefer ascending. Demi-human level limits? It’s so rarely an issue... We’ll see. Should thieves be a class? Sure. Do characters get non-weapon skills? Eh. It was a really big part of 3rd edition but it seems mostly unnecessary. 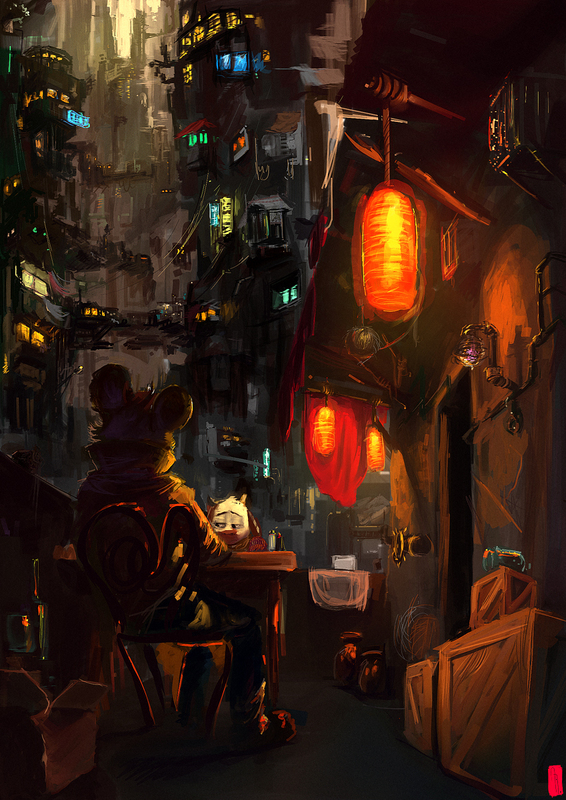 I like the idea of characters taking a background like sailor or farmer or scribe. From there it’s easy to work out the sorts of things people can do. Are magic-users more powerful than fighters (and, if yes, what level do they take the lead)? If they survive? Sure. Do you use alignment languages? No. XP for gold, or XP for objectives (thieves disarming traps, etc…)? I don’t see this as a binary. I’ll happily provide XP for gold, quest objectives, role playing, etc. Bonus Question: Unified XP level tables or individual XP level tables for each class? Yes, though I think the ones in the RC could use some slight tweaking. In my last post I showed 2 stat blocks for the same NPC. Equipment: Studded Leather +1, Saber (counts as longsword), Golden Eagle animal companion. The top version above is based on the stat block style from the Birthright Player's Secrets booklets, the lower one is from one of the basic edition boxed set adventures. I actually went back and forth a couple of times about which set to use, and debated using the usual Rules Cyclopedia monster stat block. They all give basically the same information, and really, what's more useful? I suppose it could be made even a little simpler, dropping the THAC0 and the Saving throws, and even the XP. For a monster that's certainly easier to put in an adventure, and you can always put the full stats in the back of the adventure or core rulebook. Makpal Abdrazakova, Golden Eagle Hunter, Lawful Human Fighter 6, AC 6, hp 26, Studded leather +2, sword, eagle. It's pretty much the same as the ones above, but maybe with more of the useful info. I definitely want to avoid stat blocks like in 3rd of 4th edition (unless for some reason I'm specifically doing a 3rd of 4th edition character) but I also want them to be useful. The rhythmic pounding of the yakmen's hooves across the field kicked up a low cloud of dusk. Off in the distance and directly in their path, a thin reed of smoke drifted up into the air, marking their destination. From deep in the tall grass Makpal whispered "Hunt" to the eagle and lifted her arm. It spread its wings and pushed off, taking flight toward the herd that trotted eastward toward the village of Aksu-Ayuly. "Archers, be ready" She ordered. 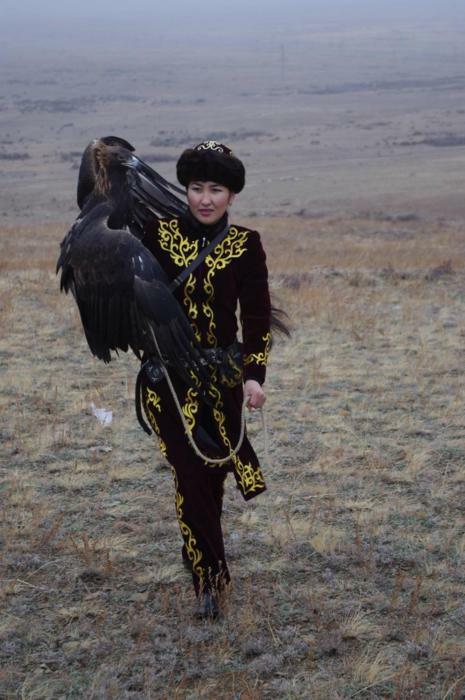 The eagle swooped toward the yakmen, silent and unseen. It struck the rearmost beast, raking its face, before lifting off again.The rest of the herd staggered to a halt, and turned toward their injured member. "Now" Makpal ordered. The archers stood as one, rising above the grass, and let their arrows fly. The yakmen staggered, and the archers let fly with a second shot. When in flight golden eagles can make a swoop attack as their first attack with a +2 to hit with their claws and inflicting double damage on a successful attack. When trained from birth, Golden Eagles will have a morale of 10. “Salinkari, we have come to render judgement upon you for your crimes against the people of-” Allianora paused as a small round thing launched itself from the middle of the hall, and exploded on her shield, sending the companions sprawling. “I warned you.” Salinkari chuckled. “Get them” he hissed wetly. More explosions followed and the companions scurried for cover. “Oh come on!” Nimble yelled as another small explosion blasted the pillar he was hiding behind. “Who cares!?! How do we get past them?” Rathgar yelled. “Don’t look at me! 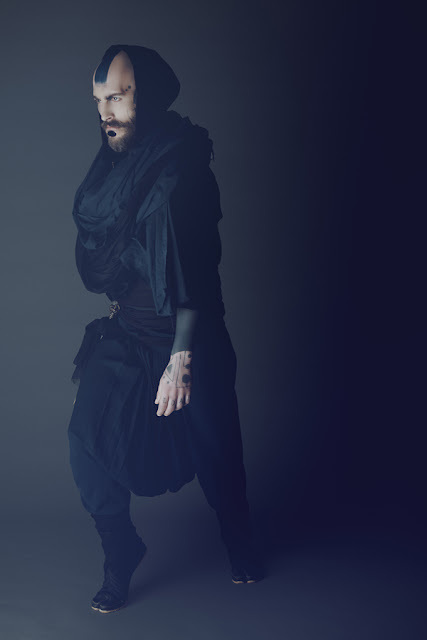 I’ve never seen them before.” A clattering noise at his feet caused Feris to look down. “Frelling-” he said before being blasted off his feet. He landed next to a small slug-like creature that slowly began to crawl onto his wounded flesh. The Grenade snail is a slug like creature, about a foot long, that has an explosive shell that it grows on it’s back. When threatened, or commanded by a slime-o-mancer (see below), the snail will toss the shell toward the perceived threat. The blast causes 1d4 points of damage to anyone within 5’, and will knock all victims unconscious for 2d4 rounds unless they save vs. paralysis. It takes a snail 3-4 days to regrow the shell. Once unconscious, the snails will converge on the victim and begin to eat it alive. 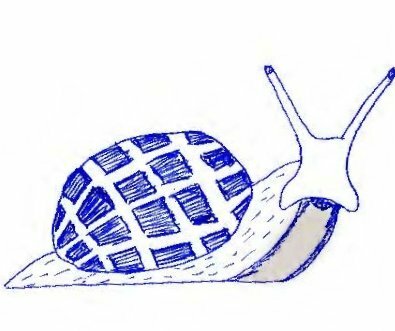 If the snail is killed before it launches its shell, there is a 50% chance it will explode. If it does not, it can be harvested and used at a later time. The snails are immune to the knockout effects of their own shells. Wizards who wish to control grenade snails (as well as other slug and slime creatures) must implant within their chests a ritually prepared slug. The result of this ritual, if the caster survives, is the ability to control slugs, snails, and slimes (as a cleric turns undead). The caster lose all body hair, and will excrete slime instead of sweat causing a -2 penalty to reaction rolls. Inspired by a post on G+ by Michael Curtis. If you're going to have elves and trolls, you can have mice and cows too. Tomorrow my players and I are going to hide from the heat in the basement and continue the adventure within the Pyramid of Darkness. The first of the Kalavakos incarnations has been slayed, and their characters are about to ascent to the second level of the pyramid. The challenges only get harder, especially since I’ve actually had a chance to prep more than I did last time, and I’m a little more aware of the capabilities of the monsters and other obstacles they’ll be facing. However, I’m off to the beach. Keep cool! But it made me wonder, what exactly is it that hits such a nerve? Is it the role playing aspect of it? The humans with funny costumes thing (which I always think of more along the lines of the bumpy forehead alien of the week from Star Trek The Next Generation)? Is it a desire to see players (not characters) stretch their role playing skills rather than their roll playing skillz? Or is it more of a wish to run something more historical? 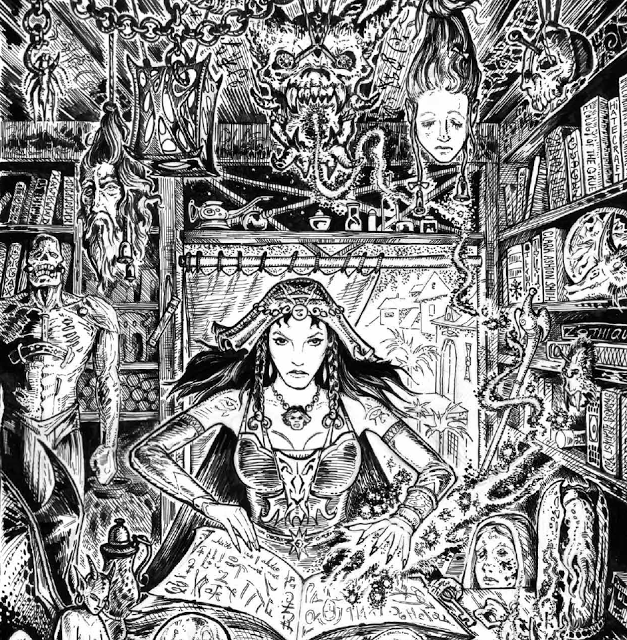 A setting or campaign idea that the DM has stuck in their brain and needs (or at least really wants) to get it out onto the table and share it with their friends? Musketeers or Greek heroes? Do I even dare ask if it falls somewhere in the conflict between story games and more gameist games? Might it be merely the novelty of it? I know I've played in games where I do something other than my usual. Heck, my highest level flailsnails character is just a mercenary fighter, well away from the usual bookish wizard that I tend to favor, and that isn't anywhere near the weirdest/most out there character I've ever played. Is there the same longing to play an all dwarf game (dragon hunting anyone?)? 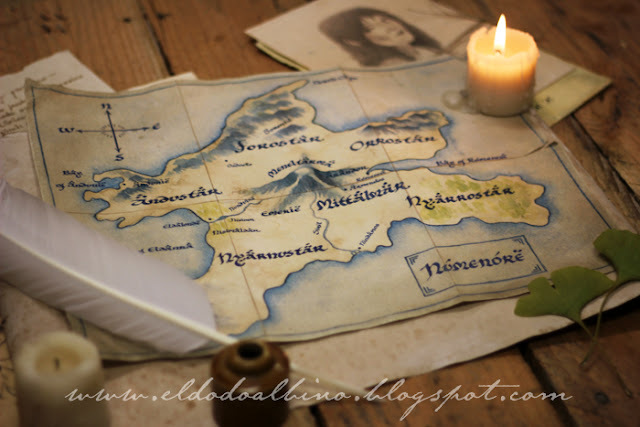 An all elf game (dandelion wine all around)? What about a Vulcan or Klingon only game for Star Trek? Wookie or Jedi only for Star Wars? Isn't one of the big reasons we play RPGs to experience something different, something "other"? To do the things we can't do in real life like slay dragons or explore strange new worlds? Is this a urge to run a more homogeneous game purely a DM thing? Or do those who only roll dice on the PC side of the screen sometimes feel the same way? I don't have any answers. Obviously I have questions, and a few ideas. My guess is that it's a DM thing more than a player thing, and it's more a novelty thing than a dissatisfaction with the games that the DM is running. Probably spurred by a movie or book that just left a little something in the back of their brain that just needs to get itched. But I could be completely wrong. Let me know if you think so, or if you have a completely different idea. 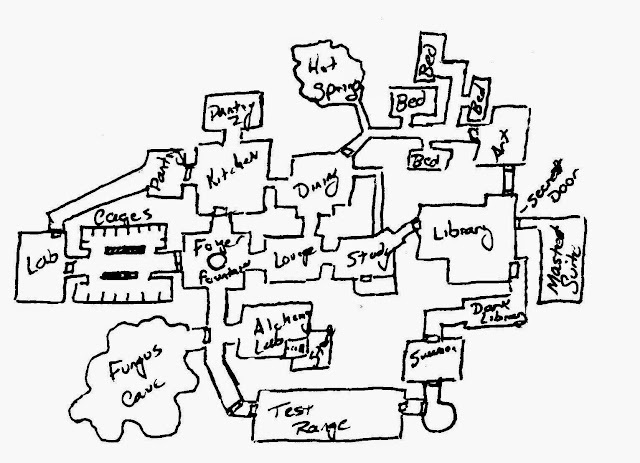 And if you've made it this far, have a map of a wizards lair from a 3x5 card. I've never had a chance to play in a humans only D&D game (or any other game for that matter). For all of the human-centric world building in the various editions, no one was ever interested. Yet it gets talked about fairly often, and really humans make great villans! I can't think of any reason it wouldn't work... Especially for the right type of game. But would it work for out of the box D&D? Keeping in all the monsters, magic and everything? And for those who don't want to leave a comment, there's a handy little poll off to the side. Last night I went with a group of friends to see Pacific Rim. We've all been wanting to see it since it was first announced. How could you not? 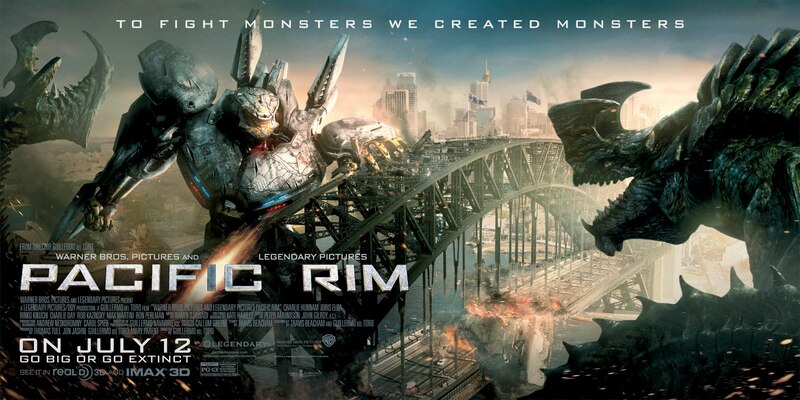 Giant robots fighting godzilla-type monsters? It practically screams Evangelion! And I mean that in the best way possible. This really was a love letter to some of the best tropes of anime. My personal favorite was when the mecha, eva, sorry, jaeger was crashing back toward the bay, and stops just as it reaches the water's edge, it bumps ever so slightly a rope hitch, disturbing a seagull who flys away to safety. It was ridiculous. No bird would hang around as two giant monsters go crashing around. It would have been out of there. Yet, for the style, it worked. The best thing about the fights was how there would be pauses, brief, but enough to allow the audience to get their bearings. It's a far departure from the Michael Bay school of noise and motion and explosions where you can't really tell one combatant from another. Ron Pearlman was fantastic, as were the gents who played the scientists. Idris Elba was a bit underutilized, though he had a couple of good lines. I was a little disappointed in his rousing speech at the end. The one from ID4 was better. All in all it was great fun. Better than pure popcorn, but also not too heavy. It's definitely a summer blockbuster, so don't expect serious scientific accuracy. Yet it's consistent, and it hangs together very well, and if you're in the mood to see some giant monsters go at it with giant robots, this is the movie you've been waiting for! Hex Maps are a perennial topic in the OSR, and there are a lot of generators out there, but if you want to make your own maps in Gimp or Photoshop, the hex icons made by the randomwizard will probably help you out. 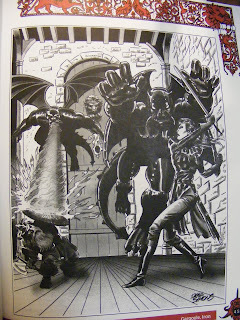 I love everything about this version of the gargoyle, especially the art! One of the most potent abilities a thief has, in any edition of the game, is backstabbing. Unfortunately in older editions it’s often very difficult for a thief to be able to pull it off. Tenkar has a few ideas/houserules to help with that. Dave Taylor does a lot of fantastic stuff with minis, and given the number of mini painters who have recently acquired 240+ Bones, this tutorial on how to paint a brassy bronze is a must read. Last year (going back a ways...) Christian of destinations unknown ran a 3.5 campaign called Quest of the Sorcerer King. While 3.5 material isn’t usually of great use to someone playing an old school game, Christian’s NPC write ups are worth the read. One of the best things about old school megadungeons are the “special” entries. They’re a great way to add all sorts of crazy stuff for characters to risk their lives playing with. The Probability "Cooker" by Billy (who goes to Mordor) is a fantastic example of a “special” that would fit right in. It basically will transform one item into another, generally similar item. Ghost towns are a very traditional location for adventure, but what if the ghosts are only a byproduct? What if it’s the town itself that’s the real terror? Of course you don’t need a whole ghost town, sometimes a simple abandoned house will do as Konsumterra of Elfmaids & Octopi shows on his d100 Strange Lonely Old Houses post. Talysman over at The Nine and Thirty Kingdoms has been working on undead monsters that scale things like ghosts, mummies, and skeletons from level 1 up to name level and beyond. The original idea was for undead monsters as PCs, but I think it works just as well if you want to have only spectral undead, or only mummies in your games no matter the level of your PCs. Charisma, what’s it good for? In the OSR it’s for hirelings. But if you’re willing to pay stupid money, why does that matter? Really, you should be able to hire as many as are available if you want, just so long as you’ve got the gold. So if you go with that theory, what do you use charisma for? Contacts! Magic Swords are probably the most versatile of all magic weapons, capable of having a wide variety of powers, but for all the charts to help roll that up, there’s a serious lack of magical effects which don’t necessarily have any mechanical effect. Jeremy, of People them with Monsters has some disturbing things to say about the classic Berzerker. You may have noticed that WotC released the Rules Cyclopedia PDF. There was a lot of chatter about it over on G+, and several blog posts about it. My love for the RC is well known, and I thought about writing about it again, but instead I went camping. 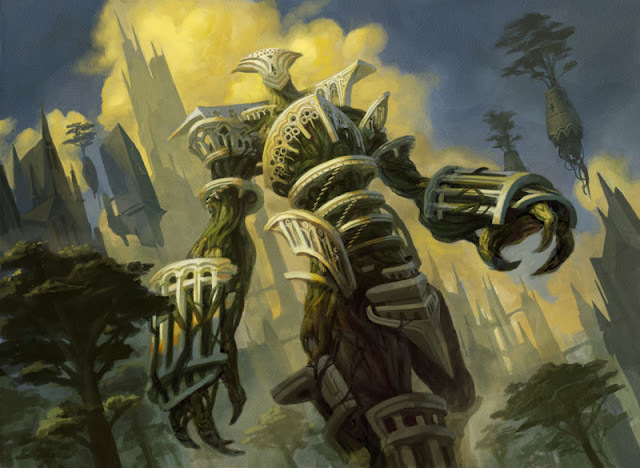 However, since WotC decided to follow that up by releasing the DMR2 Creature Catalog, I thought I'd write something about it, since it's such a good book. Well, it turns out I already did. 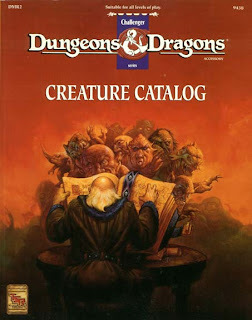 Way back in 2010 I wrote a review of the D&D Creature Catalog, and I'm reposting it here, slightly updated. I recently reacquired the D&D Creature Catalog. I had a copy back in my Rules Cyclopedia days, and as I was working on my megadungeon I remembered a few choice entries that I wanted to make use of. E-Bay delivered me a well loved copy for $4. It complements my well loved Rules Cyclopedia, but I do wish I still had my original. For one thing I think it was in better condition... but it was lost somewhere in one of many moves, sad to say. For those unfamiliar with this fine volume, it is the equivalent of the Monster Manual II for later editions. The Rules Cyclopedia includes 179 different monster listing (in this case counting "Bears", "Dragons", "Spiders", etc. as one entry). The Creature Catalog adds an additional 154 critters. There are some that I'm not sure ever made it into any future products, and others that I think are just cool, so I'm going to share some of them with you, my dear readers. The Gray Philosopher tops the list of my favorite creatures from this volume. This poor tormented gent was a chaotic priest who was so distraught at various internal philosophical debates that his soul refuses to move on until they're resolved. 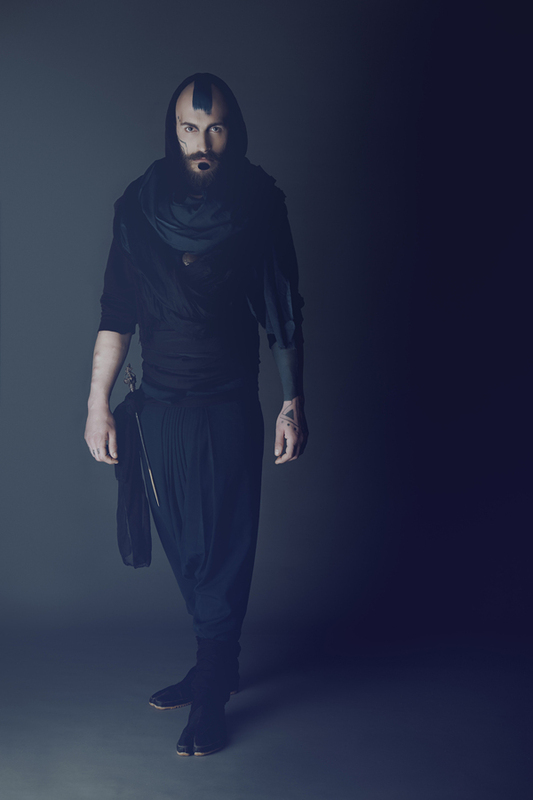 Over time his dark thoughts begin to take on a malicious form. 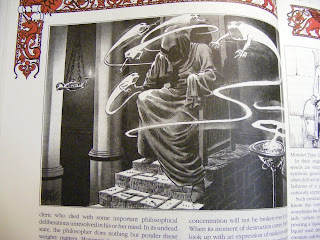 While the Gray Philosopher will ignore you, his malice won't! He isn't much of an team player, but he can make for a spooky encounter. 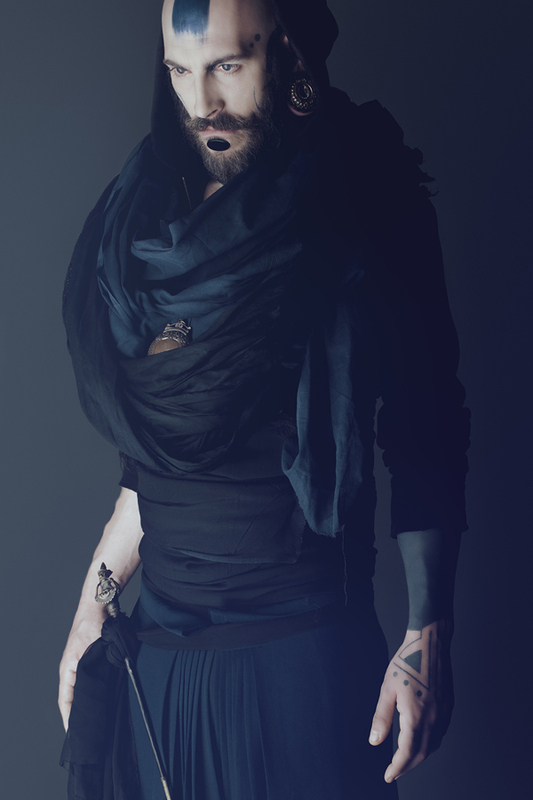 The Nosferatu is a vampire variant who has control over whether those he kills return as vampires. A good alpha villain who can be a former fighter, thief, cleric, or magic user! Dragonflys are giant magical insects with breath attacks that mirror those of the dragons. The faithful Dog is also listed, with 3 varients: Dog, War Dog, and Elven Dog. A well trained war dog makes a nice addition to any adventuring party, especially if you get it some armor. In addition to the elven dog, there are a number of other fey creatures included like Brownies, Red Caps, Coltpixy (fairy horse), Faedorne, Flitterling, Shargugh, Silver Warriors, and Wood Imps. The Rakasta also make an appearance, though not as they appear in later editions. In this edition, the Rakasta are a humanoid species that seems to be as native to the Known World as orcs and goblins. They are cat people who's society mimics that of the Mongols. When they appear in the D&D Thunder Rift adventure Rage of the Rakasta their society more closely resembles that of feudal Japan (aka samurai and ninjas). Either way they employ metal claws that do 1d4 damage each. Other notable humanoids are the Gator Man, Hutaakan (jackal people), Kara-Kara (tropical orc like people), Lupin (dog people), Nagpa (vulture people), Pachydermion (elephant people), Shark-Kin, Sis'think (The Desert Scourge - Lizard people), Snappers (chaotic turtle people), and Tortles (lawful turtle people). 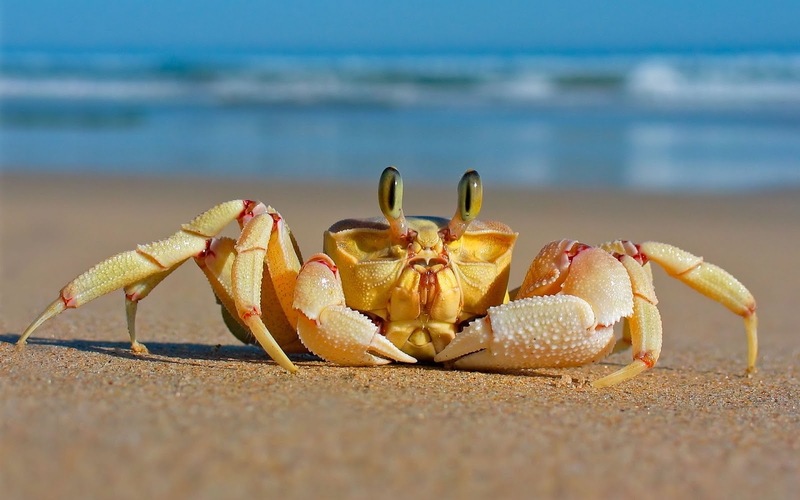 In addition to the creatures there are a couple of pages discussing using the various creatures and suggestions for creating your own variations on existing creatures. Everything from re-skinning monsters to adding new powers is covered, along with making unique named monsters to really amp up the cool factor. At the end of the book are a variety of wandering monster charts, and an index of all D&D creatures for the Rules Cyclopedia era, and in what product they can be found in. The art in the book is overall pretty solid. 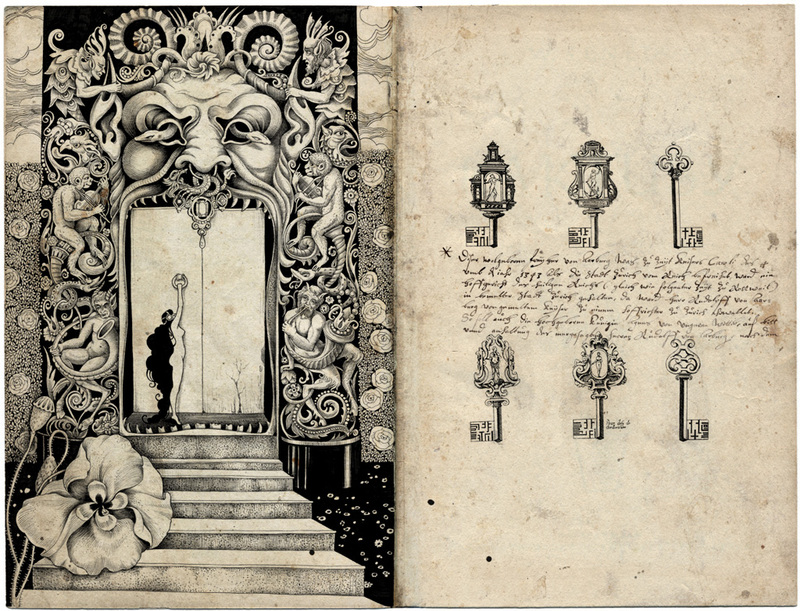 Most of it is fairly basic pen and ink, some more detailed than others. There are a number of creatures all done in the same style, mostly undead that give us remarkably similar headshots. Granted there often isn't a whole lot that makes various undead look different from one another, even if they function in completely different ways, but the artwork is just too similar. My favorite artwork has to be that of Dave Simons, of which there is remarkably little to be found via Google search. It's definitely the best of the book. Here are two pieces I really like: The Gray Philosopher and the Iron Gargoyle. I'm looking forward to incorporating some of these beasties into my megadungeon. If you come across a copy, it makes a nice addition to the monsters included in the Rules Cyclopedia, and I heartily recommend you add it to your collection. If you can't find a hard copy, pick up the PDF. It's totally worth it! My order came in a 2-corgi sized box. 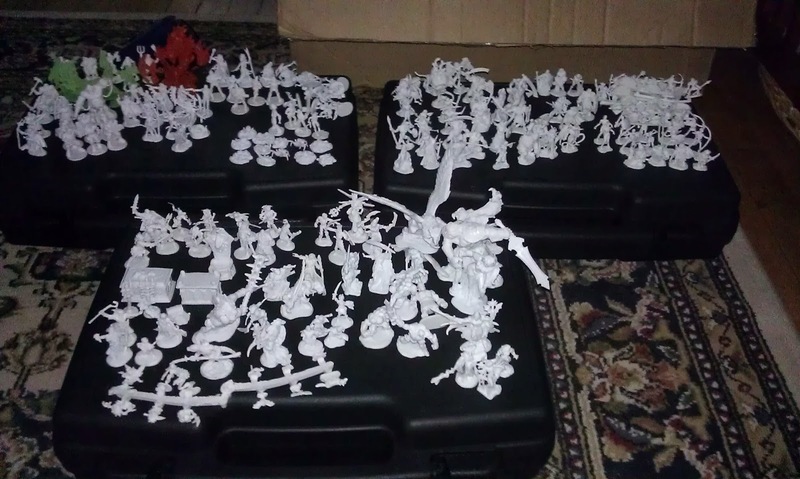 Packed within were my 4 figure cases, 48 paints, Vampire box with 243 minis, and the extras I got, including a couple of dragons, demons, a hydra, and of course Kaladrax! Opening everything took hours. It could have gone faster, but of course I had to check each and every mini out. Then, once unpacked I had to inventory them all. There's something amazing about having all of these minis just waiting to be painted. This has adventure site written all over it! It's a well established truism that wizards are weird. 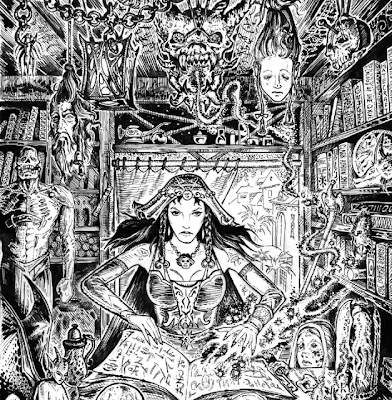 That they involve themselves with things man was not meant to know, consort with demons, dabble in alchemy, collect assortments of strange, bizar, and sometime disgusting items. 2. Velra's Pristine Robes - Always clean, even when wading through dungeon muck. 3. Red Mountain Robes of Comfort - Temperatures between freezing and 110 are equally comfortable to the wizard. 4. Student's Robes - Allow a wizard to be fully rested on 6 hours of sleep (must be worn for the previous 18 hours). The sky was still pink with the dawn as the companions rode slowly down the dirt path. On either side, as they departed the village, were fields divided by tall blooming hedges. As they made their way along the path, the sound of something heavy being knocked down was followed immediately by a loud grunt on the far side of the hedge. A voice roared “LOOK OUT!” and from the other side of the hedge something large was charging toward them. The companions kicked their horses into action and they sprinted forward just as the hedge exploded in flame and flying twigs. A red and gold form was followed by a large black bull. The red form spread it’s golden wings and pushed off the ground just as the bull was about to catch it. The bull stomped and snorted, and turned to face the companions. “Ride!” Alliaora yelled, and the companions spurred their mounts away. “It was really upset about that drake” Rathgar pointed out. “So what you’re saying is...” Nimble trailed off. “It was a dragon.” Feris bit into the apple "but a small one"
Flit is an unusual dragon, not truly a red, either in physical appearance or in outlook. He is extremely curious, not particularly viscous, with a tendency to not realize his own native power. He will rarely initiate combat, but will respond with any aggression with his full ability. He prefers to fight from the air where he can use his breath weapon and spells with less opportunity for injury. In spite of his youth, Flit has managed to acquire several grimoires, and has learned a wide variety of rare and unique spells. Because of this he casts spells as a 6th level magic user. Over on Google+ there has been a trend of crowd sourcing gaming material (aka Gygaxian Democracy). One of the biggest ones was the Hexenbracken, an unkeyed hex map that was started by Zak Smith, and filled in by anyone who wanted to toss in an idea. It was followed by Krall, Zhaar, and now Synthexia is in progress. What is known of the Hexenbracken is that it is characterized by shipwrecks, goblin raiders, and a very thin veil between this world and the next. There are rumors of hyperintelligent monkeys, Queen Jane suspects an insect cult in the south, and the central mountains are dominated by the ruins of an ancient black marble city. The Kraal is a frozen waste full of frost giants, mastodons, devil swine. A land of never ending winter. The sand grinds down, the fungus overtakes, and the land itself manifests volcanic fury in The Colossal Wastes of Zhaar. Some must have prospered here, their ruins used and re-used by those who now scrape a living from this desolate stretch. Conflict stirs as many factions vie for control of the few pockets of wealth and comfort. The ram-horned, insects, jackal-men, scaled creatures great and small, and those from outside live among monuments to the dead and undead, strange machinery, creeping sands, and stalking lava. What's Synthexia about? Crystal swords, laser beams and synthetic 80's fever dreams. This is the map of "Synthexia", the last fragments of a shattered world within the void held together by forgotten remnants of the oldest magics. There's still some time to get your crazy ideas out there... Just click here! There's just something wonderful about a map, even more so when put together in such a tableau as this. I wish I had the time to create such wonderful maps and props for my games. Unfortunately it seems that most of the time I end up just printing something out, or even just showing a picture on the computer screen. There have been a few times where I've gone and made maps and props like this for a game, but they've primarily been for LARPing, and usually for my own costume. Have you ever made a prop map for your game? Poll off to the right, as usual!